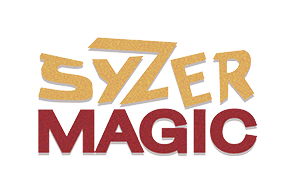 Syzer Magic, PVC Cement, PVC and UPVC cement, Clear Heavy bodied. 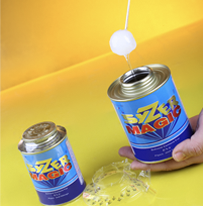 SYZER MAGIC is the first technological accomplishment for aci; resulting in the creation of a strong brand name developed solely by aci Corporation, offering a product used as PVC and UPVC cement with a complete Egyptian know-how. 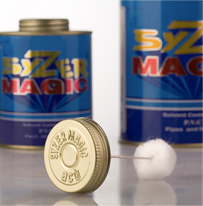 The clear heavy bodied, ultra strength SYZER MAGIC is formulated precisely for welding large diameter and high pressure pipes and fittings that are primarily used in the irrigation networks installation. 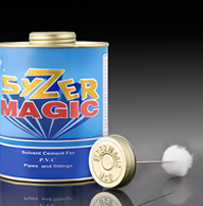 SYZER MAGIC has medium drying/setting time—unlike other solvent cements that are used for small and medium diameters— to give sufficient time for adjusting and assembling large diameter pipes. 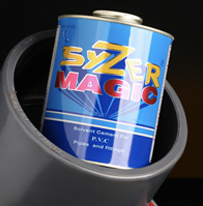 It is known for superior bonding properties, and PVC pipes welded by SYZER MAGIC resist pressure until 54 bars, with no leakage or separation in the place of sealing. Manufacturers and traders of PVC and UPVC pipes.